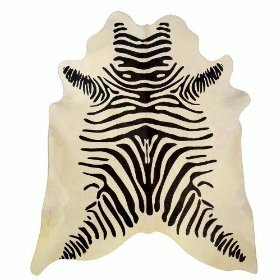 This Zebra hide rug will enhance any decor and will make sure presence of style in any room. Black zebra stripes on beige background. A cowhide that has been tanned properly – and there are many that aren’t – will not shed under normal wear. It has a clean sheen, and is tanned with a superior process that provides suppleness and longevity underfoot. An inferior cowhide will often have a chemical odor, is stiffer, has a duller coat, and often has an asymmetrical shape. US SHIPPING ONLY.